Teen Mental Health Programs: What Works — and Why — in Schools? Seeing some 400 teachers and school service providers flooding into the Halifax West High School auditorium on July 20, 2017 was an eye-opening experience. In the middle of the summer, they committed time to a two-day conference focusing on child and teen mental health. Led by Dr. Stan Kutcher, the Mental Health Academy was filling a real need in the school system. With the news full of stories warning of a “mental health crisis,” teachers in the K-12 system are feeling anxious and more conscious than ever of their role in the front lines of education. What Dr. Kutcher’s Academy offered was something of a tranquilizer because he not only rejects the “crisis” narrative, but urges classroom practitioners to develop “mental health literacy” so they can “talk smart” with students and their parents. The fifth edition of the Mental Health Academy, initiated in 2006 by Dr. Kutcher, studiously avoided adding further to the noise and sought to advance teacher education in mental health using evidence-based research and programs. Stress can be good and bad, Kutcher reminded us, and we need to be able to distinguish among the three types of stress responses identified by the Harvard Center for the Developing Child: positive (daily), tolerable (regularly) and toxic (extremely rare). Instead of pathologizing “stress” as “anxiety,” what children and youth need most is “inoculation” to help build a more robust stress immune system. While the incidence of teen mental health problems is not appreciably different than it was fifty years ago, we are far better equipped to respond to the challenges in and around schools. The MH Academy amply demonstrated how much more we know today about adolescent brain development, school staff self-care, anxiety, depression, eating disorders, substance addictions, and teen suicide. Educating teachers about that research is the real purpose of the Academy. Mental health disorders are serious and teachers are well-positioned to assist in early identification. About 1 in 5 people may experience a mental disorder during adolescence. If left unrecognized and untreated, they can lead to substantial negative outcomes in physical and mental health, academic and vocational achievement, interpersonal relationships, and other important life experiences. Despite this tremendous burden of mental health disability, youth requiring proper care still do not receive it from childhood through to adulthood. Lack of knowledge, presence of stigma, and limited access to care all serve as barriers to addressing mental disorders and alleviating the daily challenges. Promoting Mental Health Literacy (MHL) is Dr. Kutcher’s mission because it is an essential component of improving individual and population health and mental health outcomes. As most mental disorders can be identified by age 25, schools provide the ideal location in which to implement interventions that can be demonstrated to improve mental health and life outcomes. Good MHL programs tend to exhibit four components: : understanding how to obtain and maintain good mental health; understanding mental disorders and their treatments; decreasing stigma; and enhancing help seeking efficacy (knowing when, where, and how to obtain proper care. A recent Canadian study of some 10,000 educators, cited by IWK Health researcher Dr. Yifeng Wei at the Academy, found that over 90 per cent of teachers lacked adequate preparation for responding to mental health issues. That is startling when one considers the fact that the survey uncovered some 200 different mental health programs being implemented in over 1,000 Canadian schools. One curriculum resource, the Mental Health and High School Curriculum Guide, researched and developed by Kutcher and his research team at Dalhousie’s Medical School, shows more promising results. It’s not a “packaged program,” but rather a full curriculum taught by the usual classroom teachers in Canadian secondary schools. Survey data collected before, immediately after, and 2 months after implementation of The Guide showed that students’ knowledge improved significantly when the program was delivered by their regular teachers. Embedding a classroom resource, delivered by usual classroom teachers in usual school settings is proving to be far better than utilizing any number of the commercially-marketed mental health programs. What’s contributing to the widespread public perception that we are experiencing a “mental health crisis” in and around our schools? Why are classroom teachers so motivated and committed to responding to mental health issues? Why are education authorities and school districts so quick to snap up the latest program in mental health, student behaviour modification, and suicide prevention? What’s the secret of the recent success of the the Canadian Teen Mental Health Curriculum Guide? Child Mental Health and the Schools: Wherein Lies the “Crisis”? Not everyone accepts her public pronouncements at face value — and a few are looking more deeply into the nature, definition, and prevalence of the so-called “child public health crisis.” Devon’s further claim that it constitutes an “epidemic” has sparked even more skepticism. Is this the proverbial twenty-first century equivalent of “crying wolf” or just a manifestation of our contemporary tendency to ‘pathologize’ social-psychological trends? Mental health disorders are serious and providing more accessible, effective and sustainable services should be a top public policy priority, inside and outside of schools. “Teenage angst,” as Ella Whelan recently pointed out, “is not a serious mental health issue.” It is important to carefully consider all public claims for their veracity and to be skeptical of mental health charities seeking to “normalize mental illness.” We must also recognize that “not all of the kids are all right.” Nor are mental health services accessible or available when and where they are needed in and around the schools. Therein lies the real problem. What ‘s driving the public call to address the “child mental health crisis” in schools? Are school authorities and educators equipped to make the critical distinction between normal ‘mental health stresses’ and serious disorders requiring treatment? Is there a danger that those ringing the alarm bells are ‘pathologizing’ teenage anxieties and stress? Is it possible to identify and support those in serious personal crisis while recognizing that competition and stress develops ‘resilience’ and is part of healthy preparation for life? Web Junkies and Schools: Should Screen Addiction Be a Public Policy Issue? An alarming new documentary, Web Junkie, recently aired on the PBS television network, and alerted North Americans to radical measures being taken to curb screen addiction among children and youth in China. It is a powerful little film exposing the alarming effects on teenagers who become hooked on video games, playing dozens of hours at a time without taking breaks to eat, sleep or even go to the bathroom. Doctors in China have responded by designating “screen addiction” as a clinical disorder and established boot camp-style rehabilitation centres to treat its victims. Internet addiction among teens may not be a diagnosed clinical disorder here, but it is now quite prevalent nearly everywhere you look—in homes, public spaces, and schools. 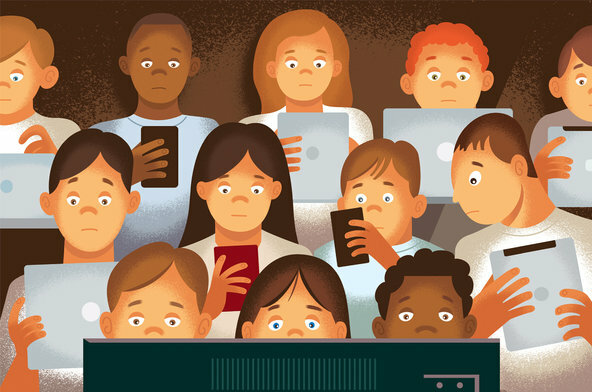 Most North American physicians and psychologists are concerned about the screen fixation when youths are plugged in and tuned out of “live” interaction for so many hours a day that it imperils their normal, healthy development. More shockingly, it starts in early childhood with toddlers being handed cellphones or tablets to entertain themselves. By the time kids enter school, they are already hooked on the latest devices. The PBS documentary spurred Jane Brody, Personal Health columnist for The New York Times, to take a closer look at this subterranean issue. She unearthed a 2013 policy statement on “Children, Adolescents, and the Media” approved by the the American Academy of Pediatrics. In it, the American pediatricians cited these shocking statistics from a Kaiser Family Foundation study in 2010: “The average 8- to 10-year-old spends nearly eight hours a day with a variety of different media, and older children and teenagers spend more than 11 hours per day.” Television, long a popular “babysitter,” remains the dominant medium, but the study showed that computers, tablets and cellphones were gradually taking over. Limiting and controlling children’s screen time was identified as a new and unfamiliar responsibility for today’s parents. “Many parents seem to have few rules about use of media by their children and adolescents,” the academy stated, and two-thirds of those questioned in the Kaiser study said their parents had no rules about how much time the youngsters spent with media. Busy and stressed out parents, it appears, see the devices as handy ‘electronic passifiers’ to calm perpetually active kids and to free up young adults themselves for screen activities, including ongoing social media interactions. Heavy use of electronic media can have significant negative effects on children’s behavior, health and school performance. Recent studies have linked “simulated violence” in video games to tendencies to act violently or to become desensitized to violence around them. Habitual users may become more adept at multitasking, but, over time, lose the capacity to focus or concentrate on what is important, affecting their problem-solving abilities. This is not just an American social phenomenon. A 2014 report conducted by WeAreSocial revealed that every day Canadians spend 4.9 hours online on laptop or desktop computers and, in addition, 1.9 hours on mobile devices. Just over two hours a day are now spent on social media, with some 91 % on Facebook and 46% on Twitter. It would be much higher for children and teens being raised in an electronic media saturated culture. Canadian psychologists and psychiatrists are beginning to take action to address the incidence of Internet addiction. The Canada Life Chair of Teen Mental Health at Dalhousie University, Dr. Stanley Kutcher, is keenly aware of the problem and attempting to promote preventative programs. In a few cities, such as Windsor, Ontario hospitals are responding by establishing services to offer clinical treatment to children, teens and adults struggling with video game and Internet dependency. How widespread is the problem of Internet and screen addiction among today’s children and teens? What can parents do to limit and control children’s screen time? Where do the responsibilities of parents end and the interests of schools begin? Is there a place for Internet addiction education the emerging mental health curriculum? Should we be looking at a public education program involving students, parents and schools?